Well its been over 3 weeks since the swim and its time to write down a quick account of what happened before it escapes my mind. We set off at lunchtime, collecting the support crew (Steve, Amanda and Andrew) on the way down to Martha Cove to meet Rohan and our boat. 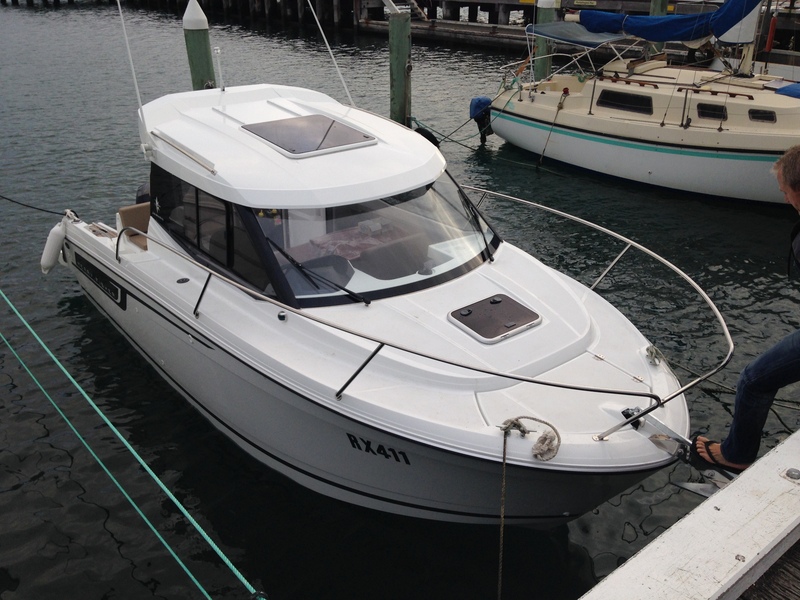 With the weather forecast not turning out as we had expected earlier in week, Rohan decided to upgrade us to a brand new Jenneau Merri Fisher 695. What a fantastic boat and without it we would never have been able to complete the crossing. The boat was so new we had to remove the plastic from the seats before setting off. After some instructions from Rohan and how to operate the boat, we set off. Initially as we motored out of Martha Cove, it felt like we were going on a leisurely cruise as the photos above indicate (last time I saw Andrew smiling on board the boat). However as we exited the harbour, we encountered some pretty big seas. Rohan advised us to try and hug the coast, heading north only when we got around to Rye. This turned out to be solid advice and after 1 hours and 45 minutes on the water, we managed to motor into Portarlington harbour and moor the boat for the night (see photo below). We checked into the Grand Hotel, dropped off our bags and headed downstairs for a meal. Over dinner, we ran through the plan for the following day. Although I felt we were under prepared, we actually had a good plan in place, all the right approvals, and all the necessary equipment. After a quick game of pool and mixing up a batch of grease (lanolin mixed with vasoline), we all headed to bed with the plan to wake up at 2am and be at the boat by 3am. I got very little sleep. All I could hear was the wind outside the hotel room and I was hoping it would die down by the morning. Some relief was that it would be behind me (from the north-west) however the weather forecast had not improved and I knew we were in for 10-15 knots with 0.5-1m seas. We all woke up as planned and although I was extremely nervous, Steve, Amanda and Andrew were very calm and made me feel a lot more comfortable. We packed up our gear and headed to the boat. None of us knew what to expect but as soon as we were on the boat we all just went into game mode and started doing the little tasks we had set ourselves. Steve guided the boat into Indented Head and after greasing up, I hoped into the water, activating my white flashing light and making my way to shore. Within minutes I was ready to go. The time was 3:40am and off we went. The first few hours were pretty uneventful and I felt great, covering 9.8km. Each time I had a feed I looked back at the lights and watched them slowly disappear into the distance. When we set off from Portarlington on the way to the start line I drank a 600mL bottle of water and that turned out to be a mistake. At the two hour mark, I was sick. My mind raced to all the stories I have heard about people being sick and not being able to recover from it but I knew I had to keep going. Hour three was tough. I felt ordinary in the stomach but kept the feeds going, adjusting the amount of water from 150mL to 100mL. That worked a treat and as we entered the fourth hour, I had a second wind and felt great again, lifting the pace back up. Just before we reached the shipping channel, we must have been caught in the tide change as we stayed in the same place for around 30 mins. 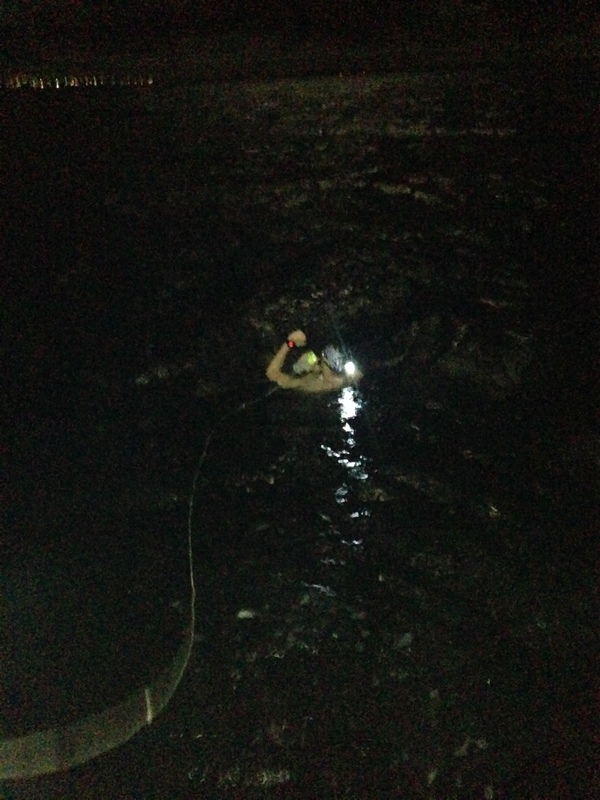 Luckily we broke through and had cleared the shipping channel at the 4.5 hour mark. 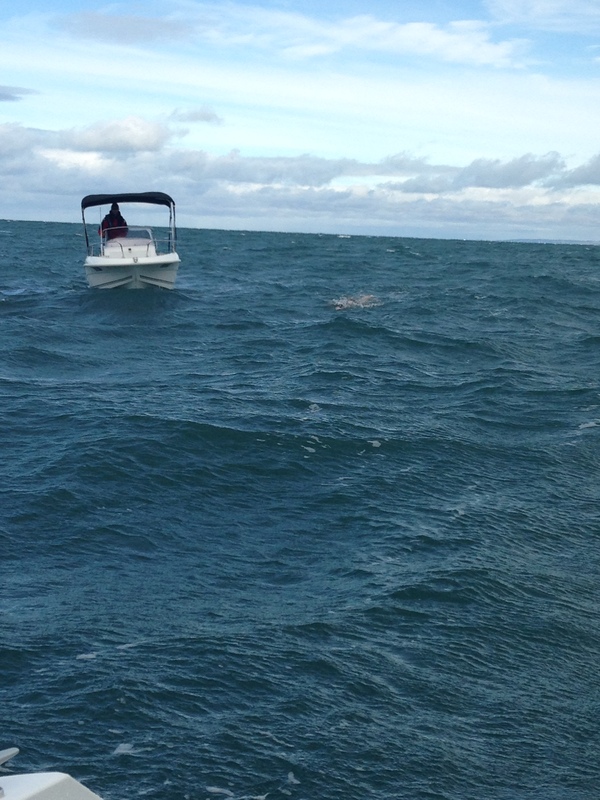 The final half of the swim started off well with Rohan joining us in his other Jeanneau boat (the Cap Caramat). We seemed to be making good progress and before long, I could see the cranes working on the new South East Water head office in Frankston. The only problem was they didn’t seem to move for about 2 hours despite the guys telling me we were making good time. The last two hours were the hardest. My shoulder started to get increasingly more painful. At first I tried to block it out but after a while I knew the pain was real. Unfortunately I had not packed any form of pain relief so just got on with the job. We moved to 15 minute feeds at this point, adding Powerade to the rotation to try and overpower the saltwater taste that had taken over. 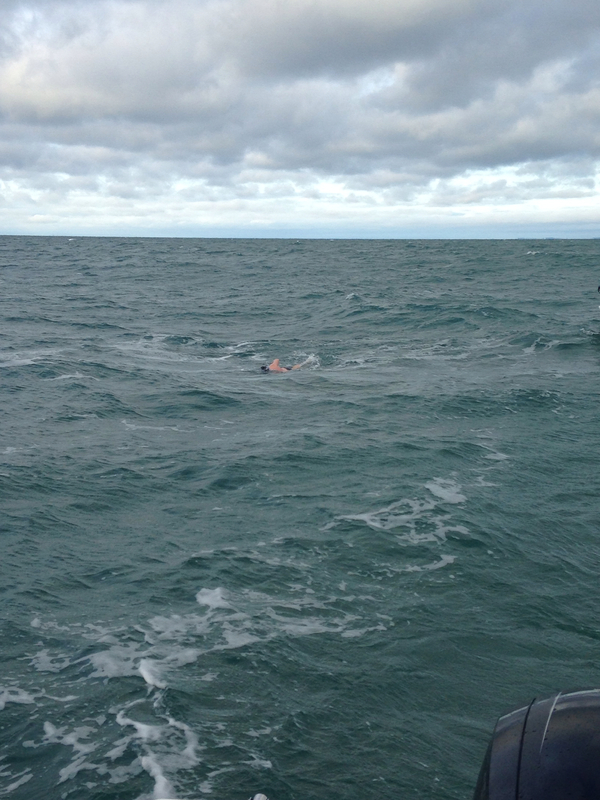 With the Frankston Pier in site, Amanda and Andrew jumped on board with Rohan and went ashore. Steve guided me in perfectly and before I knew it I was on the beach, greeted by an incredible crowd of family and friends. 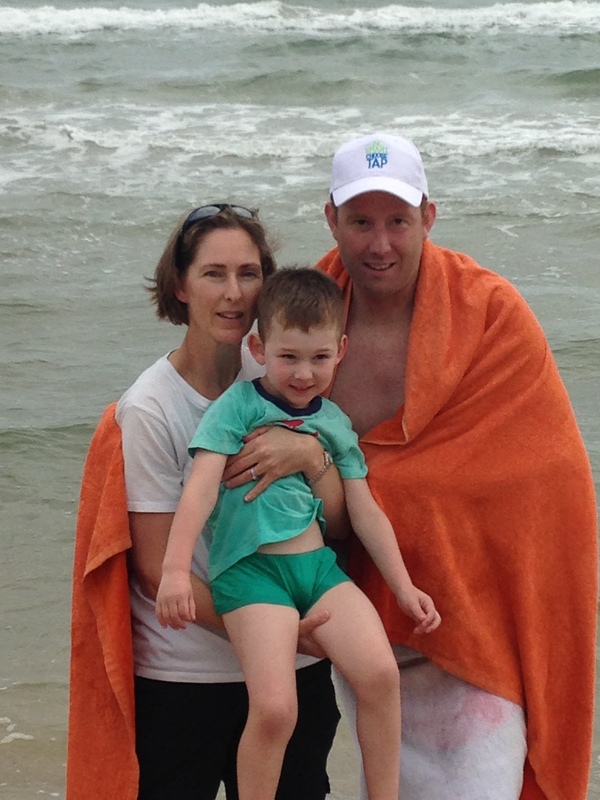 It was quite an emotional experience to see my son Ben run up to me and say “did you have a good swim dad”. That was followed by seeing Charles’s brother and Thea who had come down to see me en route to the airport – amazing! In the end I ended up swimming around 37km in 10 hours and 10 minutes (35km in a straight line but I zig zagged behind the boat quite a bit). This was around 6 hours faster than the previous record and just under 1 hour shy of the overall record held by the Van Wisse’s who swam with the assistance of a shark cage (9 hours 13 minutes). Steve’s efforts on the day were nothing short of outstanding. He fought the chop the whole way and somehow managed to keep the boat almost perfectly straight. I’m not surprised his arms were absolutely burning afterwards. You are a champion! Amanda and Andrew are absolute legends. They prepared my feeds, updated social media, did radio interviews, updated the log book, and had an eye on me the whole time. Whenever I needed motivation to keep going I just looked up and thought about them giving up their weekend to help me out and not letting them down. lanolin is the nastiest substance I have ever come across – but it stops chaffing. take pain killers to the English Channel – I will almost certainly need them. Shark Shields are more frightening than actual sharks. After Paul demonstrated them to Steve and I, we were both so afraid of them we didn’t end up using them for fear of being electrocuted. if you are in the support crew, take sea sick tablets before you set off. Andrew will confirm this! 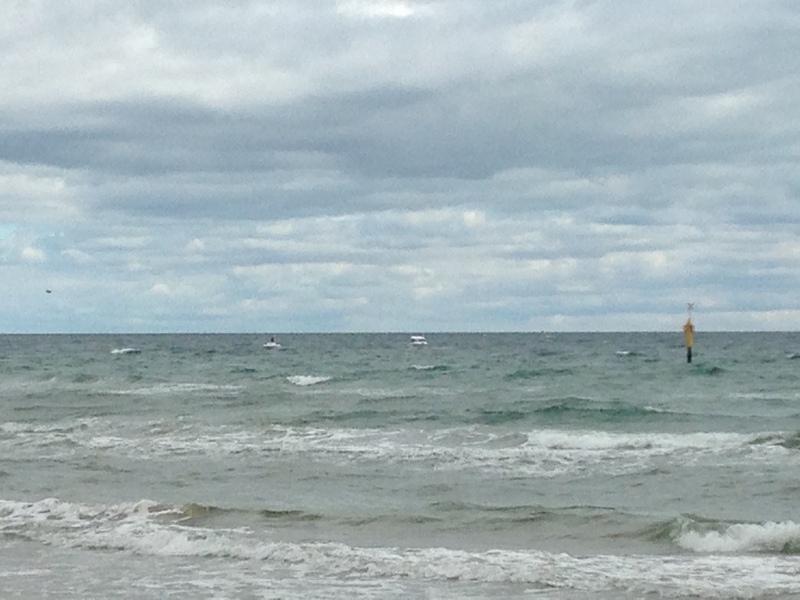 we could have picked a better day for the swim weather wise – like the following day which was dead flat with virtually no wind. my feeding strategy works. What a relief! I’m not sure if there is any marine life in the Bay – I didn’t see anything other than seaweed. 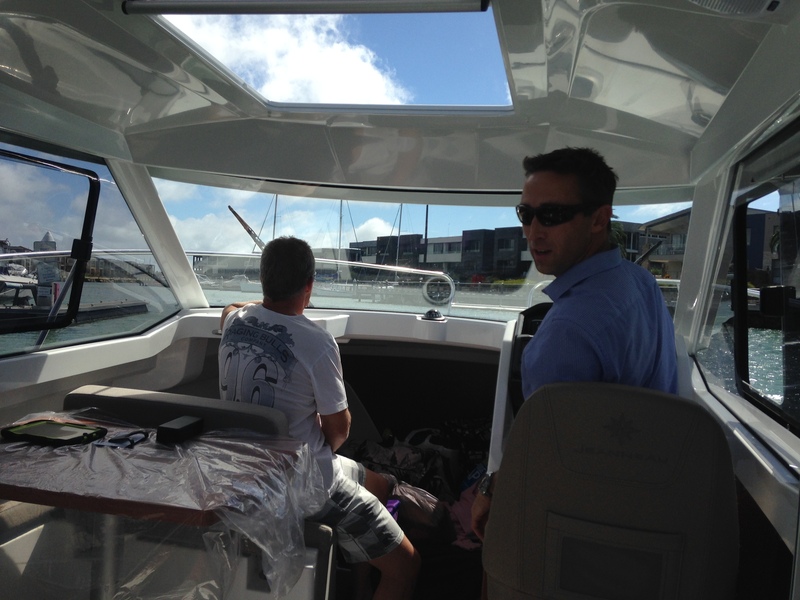 Jeanneau boats are awesome. If I was in the market for a boat that would be my first choice! I already knew it, but open water swimming is a team sport. You can’t do it without the support of your family, friends and support crew and I was blessed to have three of the best mates you could hope for on my boat. Can’t thank you guys enough and hopefully I can repay the favour sometime soon. I feel super confident about the English Channel knowing I will have Amanda supporting me, especially after what we learnt out there on Port Phillip Bay. 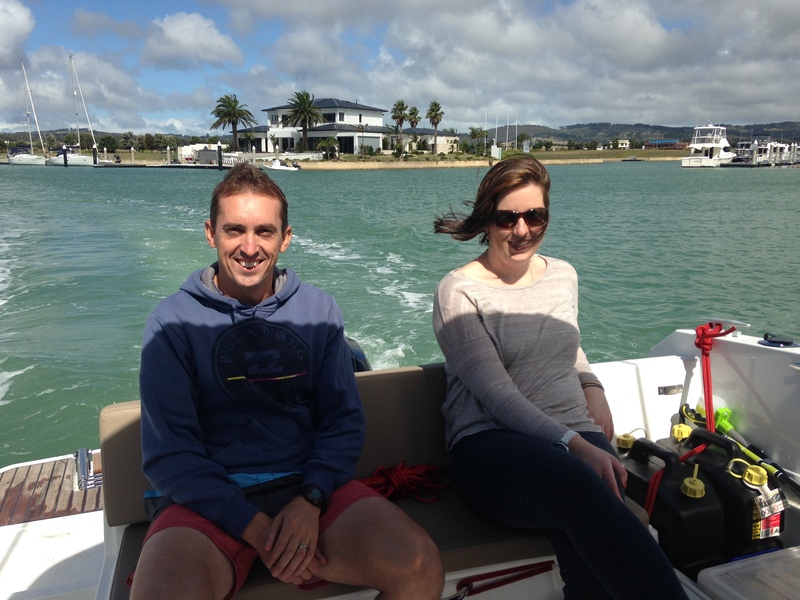 Massive thanks to Rohan for the boat, his support out on the Bay, and advice, before during and after the swim. Your a great mate and I really appreciate you being there for me. Thanks to Chris White for the Shotz gels. They worked a treat and kept me full of energy. 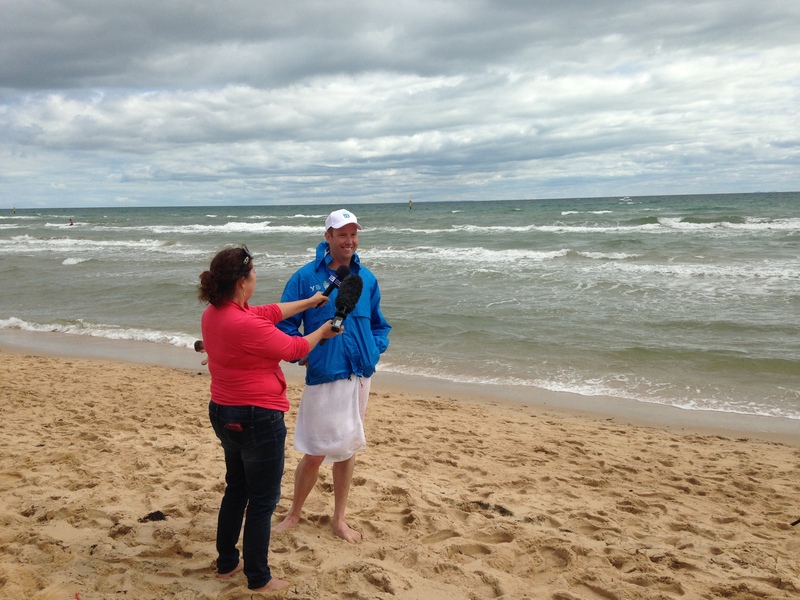 Thanks to Chloe and Nic for being such great coaches and getting me ready for the swim. Thanks to Cheryl West and Mandy Hay for organising all the media. You exceeded all my expectations and in the end the coverage was almost over the top! Thanks to Choose Tap for supporting the swim. The bottles were fantastic and the message about encouraging people to drink tap water (which in Melbourne is some of the best water in the world) is brilliant. Not a lot of people realise that you actually loose a lot of water from your body while swimming that needs to be constantly replaced. The biggest problem with swimming is that you have a lot of time to think about things. Much of my time was spent thinking about my mate Charles and what he would have thought about this crazy adventure. At times I felt like he was swimming alongside me. Finally, thanks to my beautiful wife Andrea and son Ben for supporting me. I know you were both incredibly concerned about my safety but I can assure you at no stage was I in any real danger. your are an absolute machine Glenn. Very well done to you and your team. I think an IS trip to th English Channel is now justified. We can all support you. Well done and good to hear about the prep and some of your logistics. Sounds like you are well on the way to getting the EC done. Good luck on the rest of your journey. I’ll be cheering you on across the tracking screen when you hit Dover.